2nd set There is no need for coming up and there is no dissatisfaction with using it. Easy to install and inexpensive. This review is about item#40475197. I bought it for the next chain exchange. Although it is a famous manufacturer, reasonable prices are glad. I think I will also buy next. This review is about item#40475215. 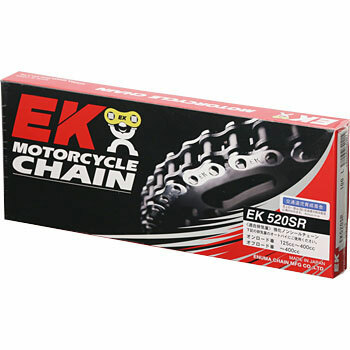 Although I exchanged a chain of motorcycles to a seal chain a couple of years ago, I felt that the movement of the chain itself was hard and I felt that the elongation ceased at high speed, so I tried to exchange for a nonseal this time. I have not been riding since exchanging, but I am looking forward to ride the movement softer than the seal chain. This review is about item#40475242. I changed the sprocket well so I made it a clip, but I missed that the 520 clip is really scary and I missed the offroad so I bought it again. We will buy caulking joints and reuse them. This review is about item#40475267. As I changed the chain again I changed my running. It is especially noticeable for inactive motorbikes. However, it is better to remove grease with high viscosity attached at the time of purchase. As soon as I removed it, my running changed again. I am comfortably and smoothly running. There is a sense of security at leading manufacturers. Also, since the number of frames is perfect, it was pulled to a place where tools are not needed. This review is about item#40475276. The number of frames is the same as genuine, easy to install joints and easy to exchange. Arrival was the best that shipped to SU than anything. It is a glass tracker. Mileage is 33,000 km, but sprocket seems to be okay so it's only a chain exchange. We placed orders on Friday night and completed work on Sunday. I can be purchased at 10% OFF and I am satisfied. This review is about item#35110013. I felt better than the product I thought. I will exchange early, so price is more important than durability. This review is about item#35110022. Although it is merely a replacement part, it can be used with confidence that it is a non-seal, manufacturer item. There is no reason to arrange replacement parts in other if arranging quickly is the major premise, and it becomes the lowest price. Since I bought 104 items of goods, it was okay to save time and effort to adjust the number of frames. It was cheap and could be purchased. GB 250 I attached it to the clubman. It is first convenient to easily find the part to be applied in the site. The number of frames was exactly the same, so it was easy to exchange. The price is also very satisfied. I wore it yesterday. The price was also cheap and I arrived early so I am satisfied. It can be used normally. It is cheaper than general mail order. It will arrive soon. This review is about item#35110031.